Sadly, not all of us are born with picture perfect teeth. Some of us have cross bites, overcrowding, gaping teeth, underbites, or much more. Luckily, both Invisalign and traditional metal braces can fix all of these problems and help you receive the smile you have always wanted. For those with specifically underbites, both of these options are extremely popular and successful ways to align your teeth. Dr. Matthew Milestone from Milestone Orthodontics is here to explain what it is that braces and Invisalign fix in regards to underbites and provide some reasons as to why someone with an underbite should seek orthodontic treatment. What is an underbite? An underbite is a misalignment of the teeth where the upper row of teeth bites behind the lower row of teeth. They are usually caused by an overgrown lower jaw, an underdeveloped upper jaw, or a combination of the two. What problems can an underbite cause? For some patients with an underbite, they can be painful. The upper and lower teeth can wear and cause possible tooth decay or the misalignment can cause jaw pain. A patient with an underbite could also experience problems with eating and speaking. Finally, sleeping, snoring, and breathing all throughout the night could be affected because of an underbite. Why should you fix an underbite? With technology now, underbites can be fixed extremely easily with both traditional metal braces and Invisalign. Both of these treatments will stop the pain which is possibly associated with an underbite. They may also prevent serious jaw problems from occurring in the future as well as make every day motions such as eating or breathing easier. How do braces fix an underbite? 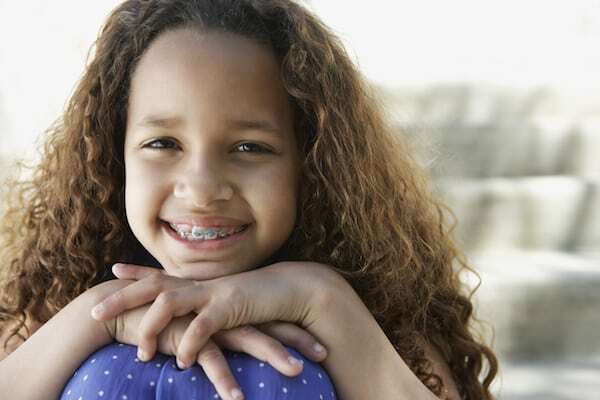 Braces are periodically tightened which straighten your teeth and align your jaw. This can help fix an underbite because as the braces are tightened multiple times over the length of your treatment, your jaw is gradually aligned with your teeth. Sometimes, an orthodontist will suggest a patient wears rubber bands with their braces. This orthodontic appliance also helps to straighten and align your teeth, therefore straightening and aligning your jaw. How does Invisalign fix an underbite? With Invisalign, you change the set every two weeks. Each new aligner brings you closer and closer to the end goal, slowly straightening and aligning your teeth. Because Invisalign is custom made to fit your teeth, the aligners will help to slowly achieve the smile you want. Therefore, every two weeks the aligners will be slowly shifting your jaw and teeth to get rid of the underbite. Just like traditional braces, an orthodontist might suggest that you wear rubber bands to enforce and strengthen the movement of your jaw. If your orthodontist suggests that you wear rubber bands, Dr. Milestone advises that you do in order to keep on track with your treatment and achieve the perfect smile you want in the end. Although an underbite is a serious issue for those who have one, both Invisalign and traditional metal braces can fix the problem, making pain nonexistent and some everyday motions easier. Dr. Milestone of Milestone Orthodontics wants to make sure your underbite is fixed and you receive the perfect smile you have always wanted. For more information on underbites or to schedule an appointment, please visit our office near Passaic, NJ, or call 201-845-8411.